This product is the follow up to my Hand Drawn Map of Ancient China! 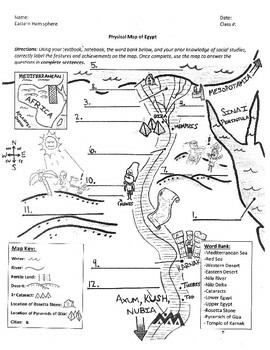 The map and characters are completely hand drawn by me, however; in this edition, I've typed up the heading, added differentiated, leveled questions and included a scavenger hunt for an extension activity. The map focuses on Egyptian geography and some Egyptian technology. 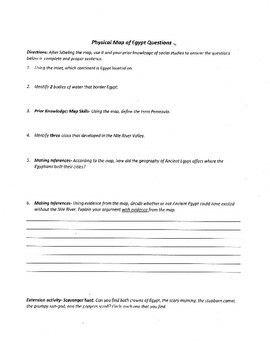 Students are required to use a word bank to label geographic features such as the Nile Delta, cataracts, and Mediterranean Sea. Some technological inventions such as the Pyramids of Giza and Rosetta Stone are also featured on the map. 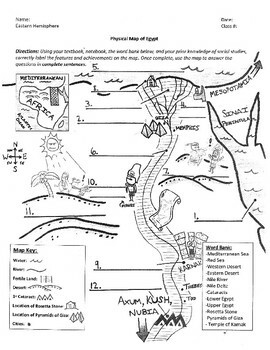 In addition, the Map includes 2 sets of questions which are differentiated, using sentence starters, for learners at various levels. 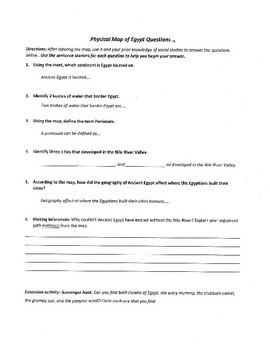 The questions are all linked to social studies skills/standards. They include definitions (RH 6.4), analyzing charts, maps, and graphs (RH 6.7), and ELA/LIT standards for Drawing Inferences.